What we call “Lean management” today actually represents a 125-plus year evolution of progressive management practice. Early efforts by management practitioners to improve (or “systematize”) manufacturing operations soon gave way to a broader recognition of the applicability of progressive management principles and practices to service organizations and government (though there were only a few examples where it was reduced to practice in service organizations at that time). Soon, the basic tools of industrial engineering became part of a larger principle-based system of management whose focus changed from “the one best way” to “continuous improvement.” World War II munitions production was the pinnacle of the Scientific Management period. Post-war prosperity saw a return to pre-World War I sellers’ markets and associated batch-and-queue processing for the next 30 years. It took a relatively unknown Japanese company, Toyota Motor Corporation, to revive interest in progressive management practices. People began to realize that Toyota withstood the early-1970s oil shocks better than most other companies in the auto industry, and other companies in any line of manufacturing, because they were not burdened by the costs and inventories associated with batch-and-queue processing. Lower costs due to lower inventories became the area of immediate interest by academics (industrial engineers) who studied Toyota’s production system. Toyota’s production system was referred to interchangeably as “Just-In-Time” (JIT) through the late 1980s. The term “Just-In-Time” would give way to “Lean Manufacturing” around 1990. This was how we would understand Lean, as a manufacturing thing, for the next 20 years, and focus mainly on solving material flow problems. Then, around 2007, Lean manufacturing gave way to a new recognition, that Lean was a management system. The term “Lean management” came into vogue and remains with us today. While we may lament the long time that it has taken to understand Lean as a progressive system of management practice, it nevertheless shows that our perception and understanding of Lean evolves over time. This reflects the learning that occurred as people gained first-hand experience with Lean and exposure to the work other practitioners and writings of thought leaders. What will we learn from our current practice of Lean as a management system, and how long will it take us to further evolve our understanding of it? 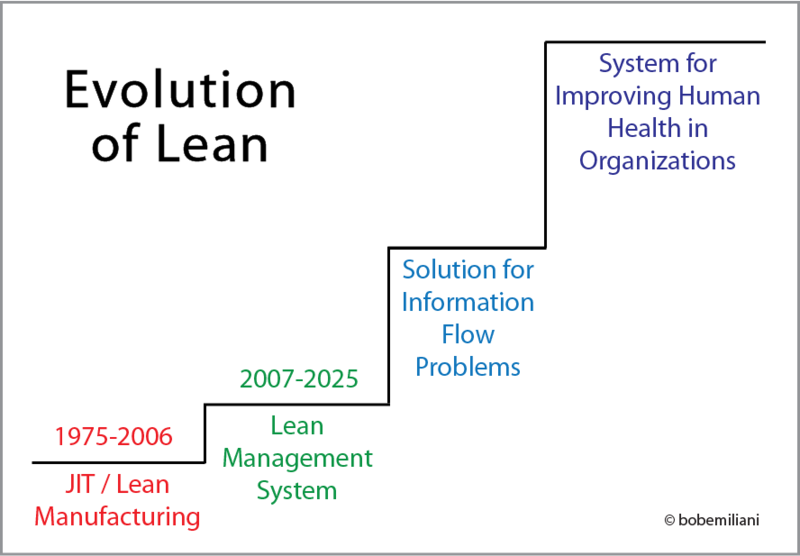 The image below illustrates the past and future evolution of Lean as I see it. We begin with JIT/Lean manufacturing and stay there for about 30 years. Then we progress to the Lean management system, where we likely stay for about another 20 years. The accumulated learning pertaining to Lean as a management system should result in the realization that Lean is more than just a progressive system of management to improve material flows. That its principles and practices represent a solution for any type of information flow problem (where material is also a form of information), whether in the shop or office, in manufacturing, service, church, government – wherever. How do you know if you have information flow problems? Whenever there is a gap between plan and actual in any work activity – which is almost all the time! These exist due to batch-and-queue information processing. Lean is a solution for any type of information flow problem in any organization. Call it the “Lean Information Management System.” We will remain there for a while, hopefully not too long, and accumulate learning that informs us that eliminating information flow problems greatly improves the physical and mental health of employees and managers in the workplace. Call that the “Lean Health Management System” (health of the company and its employees). An organization that does Lean right is a much better and much healthier place to work. This will culminate in the realization that Lean is a system for improving human health in organizations. This, then, will become the fundamental reason for adopting Lean management. Leaders will happily take all the other wonderful financial and non-financial benefits of Lean for the company and all of its key stakeholders: customers, suppliers, employees, investors, and communities. Can the slow learning that has taken place in the past, and will likely take place in the future, be replaced with more rapid learning? 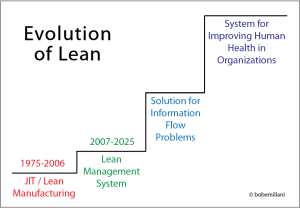 Have we learned well-enough, by now, that Lean is a solution for information flow problems and enter the phase where the payoff is greatest for humanity? Can we now grasp Lean as a system for improving human health in organizations, or will we have to wait 20, 30, or 40 years to finally realize that?